Earn up to $560 Cash Rebate Yearly! of up to S$1,000 spent per month per card account1 on your Diners Club/Don Don Donki Cobrand Regular Credit Card at Don Don Donki outlets. 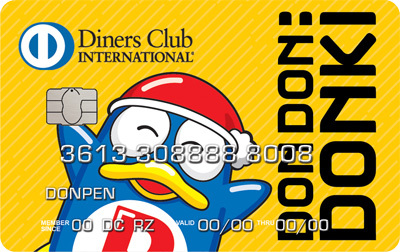 of up to S$500 spent per month per card account1 on your Diners Club/ Don Don Donki Cobrand $500 Limit Credit Card at Don Don Donki outlets. Rebate is earned in the form of REBATE$. (1 REBATE$ = S$1). REBATE$ can be earned and redeemed at all Don Don Donki outlets upon successfully charged to Diners Club/Don Don Donki Cobrand Credit Card. REBATE$ is calculated on the gross total amount before GST, less the redemption values of gift vouchers and/or previously-earned REBATE$; if any. REBATE$ earned is credited on next day basis. Redemption can only be made after rebate is credited. REBATE$ is earned on per card account1 up to a maximum of 5% of S$1,000 (for Regular Credit Card) or 2% of S$500 (for S$500 Limit Credit Card spent per month regardless of the numbers of supplementary cards held. REBATE$ will expire in 60 days. Unused REBATE$ is not exchangeable for cash, not transferable and non-refundable. Expired REBATE$ will be forfeited. Extension of REBATE$ will not be allowed. The monthly maximum entitlement of REBATE$ includes the earning of REBATE$ among the Basic and Supplementary cards (if any). In the event that REBATE$ awarded exceeds the monthly maximum entitlement, Diners Club reserves the right to debit the card account without prior notice. Diners Club reserves the absolute right to amend/withdraw/terminate immediately the above-mentioned REBATE$ at any time without prior notice. In the event of any dispute, the decision of Diners Club is final. 1 Per card account includes both basic and supplementary cards. This Card is not applicable for Corporate card application.
. . . & many more ! and mail it to us.